The birches of the White Forest form a natural wall between five nations, and its sheltering boughs have become a safe haven for insurgents and political exiles from the Canton of Melana. Melanian humans chafe under the rule of dwarven nationalists and warmongers while oppressed kobolds yearn for total revolution. Amidst the chaos, a dwarf loyalist group called the Iron Spike has taken to quietly “disappearing” political dissidents. While traveling in the forest, a chance encounter embroils the PCs in this conflict. 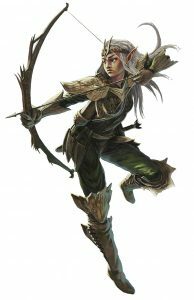 The elf veteran archer (Tome of Beasts) is named Xi Derina. The beast she’s hunting is a serpopard (Tome of Beasts) that recently attacked her camp. If they get the chance to talk during or after the fight, the elf explains that she is protecting a group of human rebels from Melana, and this monster must have been sent by their enemies. Depending on the PC’s level, the combatants may already be wounded. If the PCs are 2nd level, neither combatant is wounded. If the PCs are 3rd level, Xi has 38 hit points. 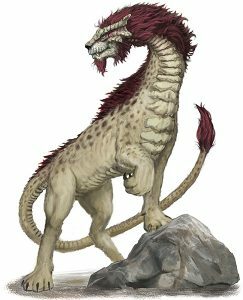 If the PCs are 4th level or higher, the serpopard’s attacks also deal an additional 2d6 necrotic damage. The serpopard was captured from its marshy home deeper in the forest and corrupted by evil magic, as evidenced by its eerie, pure white eyes. It stops fleeing if a PC strikes it and—against its usual nature—turns to fight to death. It targets Xi first and then the nearest living creature. Developments. Regardless of the serpopard’s survival, proceed to Encounter 2 at dawn of the next day. If Xi survives the encounter, she requests that they follow her back to camp; proceed to Encounter 2 at dawn of the next day. If Xi does not survive the encounter, she may tell them how to find the village with her last breath. The corrupted serpopard was the work of the Iron Spike, and the PCs who killed it are now considered accessories to rebellion. One day after Encounter 1, a team of Iron Spike killers come to put an end to their enemies once and for all. If the PCs found their way to Xi’s camp, they find a small team of human and kobold revolutionaries, including one human veteran, one kobold alchemist and trapsmith (Tome of Beasts), and 10 guards. Depending on the PCs’ level and their number of allies, the number of Iron Spike thugs varies. If the PCs are 2nd level, they encounter one dwarf cult fanatic and four thugs. At 3rd level, add one cult fanatic. At 4th level, also add one black knight commander (Tome of Beasts). If the PCs are in the camp, double all Iron Spike forces. Developments. When the Iron Spike forces are reduced to half, someone shouts for a runner to be sent back to High Command. If the runner escapes, the Iron Spike’s leaders take interest in the PCs; proceed to Encounter 3 after some time. If the runner is captured, she pleads that she was “just following orders” and begs for mercy. Even if the PCs meddle no further in Melanian politics, the Iron Spike considers them a threat to national stability. Two of their best agents, the human assassin Sofía—a suave, Bond-like professional—and the dwarf mage Thurl—a jovial gambler—hunt the PCs, using poison and necromancy to strike fast and escape. Depending on the PCs’ level, the encountered assassins vary. If the PCs are 4th level, the dwarf mage Thurl attacks alone. 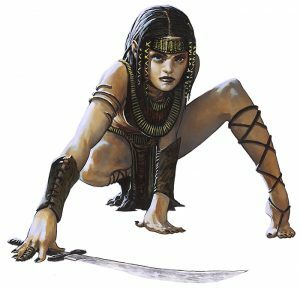 If the PCs are 5th level, the human assassin Sofía strikes alone. If the PCs are 6th level, both killers work together. Developments. If the PCs kill their assassins, the Iron Spike deems them too dangerous to pursue unless they return to Melana and cease their pursuit. If either assassin escapes, they are impressed with the PCs’ talent and begin shadowing them, perhaps to become an ally.